Thiruvananthapuram, India, Nov 18 2015 (IPS) - Until September this year, Lissie Sunny was not a name known to the Indian public. All of this changed when this lean and dark woman, working for over a quarter century plucking tea leaves in the misty mountain slopes of southern India finally had enough and took on one of the most powerful tea companies in the world. The 47-year-old tea labourer in the Idukki district of the southern state of Kerala, along with 6,000 other ill- educated women labourers held protests as they said they had been exploited for years and were now ready for their rights. The male labour union leaders were put on notice the history of male-dominated national trade union politics excluding women was about to change. Weeks of protests led by Lissie at the Kanan Devan Hills Plantations, controlled by the Indian multinational Tata, which had clamped down on not only the growing unrest due to exploitation of women workers for years but also the gender-based discrimination in the tea sector. Lissie with vast support, helped form the Unity of Women, popularly known as Pompilai Orumai (PO) and notched up another victory by winning three seats in local self-government elections held recently. Lissie Sunny was then formally elected as the president of PO and said that though the extraordinary rebellion was initially against the union’s decision to cut the bonus paid to tea pickers but the actual revolt has deeper roots. “The unions have been cheating workers for generations. They have a mutual tie-up with the tea company managements. The leaders lead a flamboyant life; get free company houses to live in. Their children get good education and jobs thanks to the plantation owners,” she said. The labour-intensive tea industry is notorious for low wages and exploitation. Workers get 233 rupees, nearly 3.50 dollars, per day which starts from 8 AM and carries on until dark. “This is half of what a daily wage labourer in Kerala gets. Women workers live in sub-human conditions, stay in one-bed huts without toilets and other basic amenities,” she told IPS. The women workers accuse the male trade union leaders of ignoring the rights and benefits of women workers while ensuring good positions and financial benefits for their relatives and dependants. Meenu Ammal, an illiterate worker, said that a trade union mafia controls tea plantations and takes huge amounts of money from owners in the guise of labourers’ welfare. “Most of the male workers are misusing their earnings while disregarding children’s education and medical needs of families. Unions have done nothing to stop men from drinking liquor. Also, leaders always managed to keep their jobs when some owners abandoned their plantations following the collapse of tea prices a few years back,” she said. 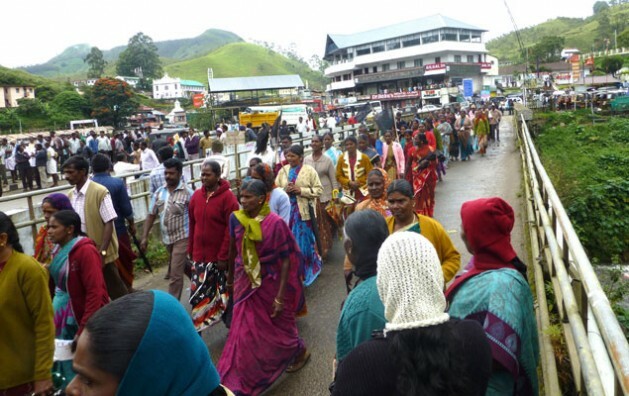 Right activists named the Munnar mobilisation as the ‘Jasmine Revolution’ in India’s plantation sector, which still suffers from a colonial hangover, and said that it reflected a strong undercurrent of unity among women to fight against the high-handedness of men in women-dominated work sectors. K. Sahadevan, a well known national human rights activist from Kerala, told IPS that a new trend is forming among women in the country to come forward for better wages and ensuring other rights of female workers. “There have been a series of strikes led by females in recent times for women. Mainstream trade unions were not involved in these. Most of these struggles were successful following innovative mobilisation strategies and support from outside the traditional union circles. Women are losing faith in union leaders sponsored by political parties,” he pointed out. Researchers in gender studies say that the rebellion of the women workers needs to be studied closely with the status of women in Kerala where development indices like literacy are very high while compared with women elsewhere in the country. Dr. Sreelekha Nair, an independent researcher in women’s studies in Thiruvananthapuram, said the tea workers’ strike is a landmark struggle that needs to be recognised for its gender aspect. “The uprising is only an indication of the women workforce coming into their own to fight for their rights. It is true that a space exists in Kerala for the united workforce to strike. This space was created by the long established trade union culture and a kind of progressive outlook towards workers. And when this space is claimed by a group that is overwhelmingly gender-based, it kind of shocks the establishment and the existing machinery that deals with strikes. That is why the government machinery then has to go into overdrive to find a ‘new’ way to deal with it,” she explained. Observers in New Delhi point out that the unprecedented female rebellion at Munnar has baffled both trade unions and various management teams in the country and has evoked keen interest among tea workers in Assam, West Bengal, Tamil Nadu and Karnataka. Dr. Siva Prasad, an expert in labour laws, said the established unions in the country are led by males who are not bothering about the women workers either in the organized or unorganized sectors. “The unorganised labourers are getting low wages and work on deplorable terms and conditions. The lesson from the strike teaches that a united struggle for rights would benefit women at large, and female workers could not be easily bluffed by politically-backed union leaders,” he told IPS.